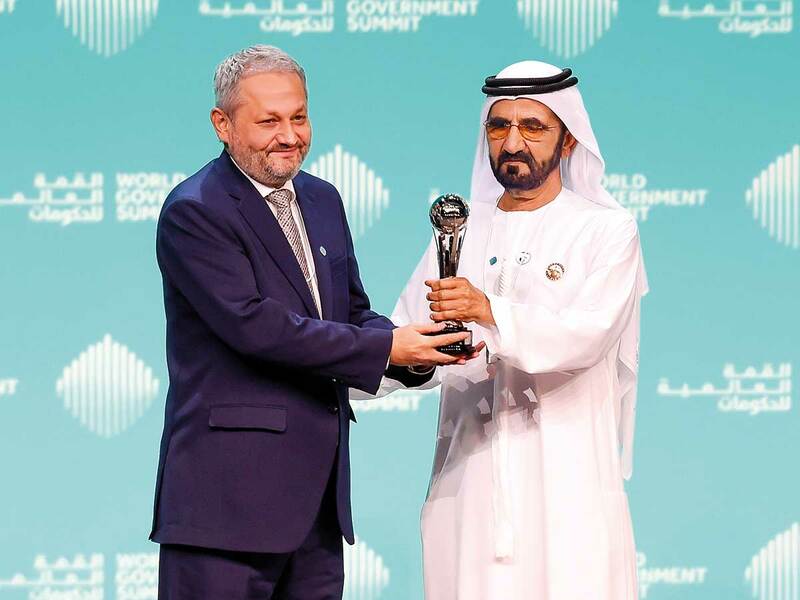 Dubai: The Best Minister Award was given to Dr Ferozuddin Feroz, Minister of Public Health of the Islamic Republic of Afghanistan, during a plenary session on the first day of the World Government Summit (WGS) yesterday. His Highness Shaikh Mohammad Bin Rashid Al Maktoum, Vice-President and Prime Minister of the UAE and Ruler of Dubai, awarded the winner, following a short video on Dr Feroz’s achievements in the public health sector. The award is given to the best minister in the world and recognises the exceptional efforts of government ministers. It highlights ministers demonstrating excellence in the government sector, implementing successful reforms and inspiring other government leaders and service providers to promote innovation within their domain to better serve the needs of their citizens. Dr Feroz, who studied medicine at Kabul University, was nominated Minister of Public Health in early February 2015, after receiving the highest number of votes of confidence of all ministers from the Afghan Parliament. On taking up his position as minister, Dr Feroz set some priorities and initiated a number of reforms and other changes, with the aim of achieving sustainable, quality results that help improve the health of the people of Afghanistan. He has worked on reducing the mortality rate in Afghanistan for under five-year-olds, by 44 per cent, and on increasing life expectancy at birth by seven years. His efforts to reduce maternal mortality and increase the immunisation of children against polio have also proved successful. Dr Feroz first joined the Afghan Ministry of Public Health as Deputy Minister, Policy and Planning in 2002, where he was instrumental in laying sound foundations for Afghanistan’s current health system. He led the development of the first mission statement of the Ministry and of the National Interim Health Strategy 2002-2004. Dr Feroz went on to strongly support the development of the Basic Package of Health Services and the Essential Package of Hospital Services. The two interventions have particularly contributed to the improvement of the coverage of health services throughout the country and have guided health workers in their efforts to reduce morbidity and mortality rates. In its second edition, a total of 20 ministers were nominated for the Best Minister Award through a world survey that included several world governments, in addition to public nominations through social media. Eight ministers were then shortlisted after a global due diligence conducted by Pricewaterhouse Coopers (PWC). A jury of international experts and key figure representatives of international organizations and the private sector selected the winner.